I love getting inspiration to create Christmas cards, it help keeps the feeling going all year-long. Today I’m playing with the current challenge at Watercooler Wednesday Challenges who have an All About Christmas challenge. Last time I was at my friend Michelle’s place, she had a new die that features a deer and tree. I cut myself a stash ready for putting together on some cards, but time got away from me until now and I finally have used them. I created an alcohol ink background to go behind the die cut and added a bit of silver thread for the finishing touch. I think next time I might try some now traditional coloured backgrounds. This morning I have been sorting my stamp sets into themes as was finding it hard to choose stamps when I had them filled by manufacturer. In doing so I came across a stamp set by Stampin’ Up called “painted harvest’ that I had yet to get inky and what would you know but it was perfect for 4 challenges! 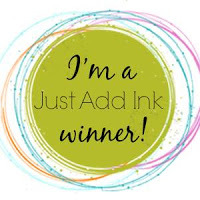 I used masking to help with making this an OLC and stamped in Stampin’ Up inks in Lemon Lime Twist, Old Olive, Chocolate Chip, Pumpkin Pie and Crushed Curry. I really like this stamp set as I love the variety of looks you can get depending on the colours you use and will be using it much more now that I’ve found it again. My day job has been getting busier and busier as some critical project deadlines approach so I really needed to get crafty this weekend to save my sanity and my friend Michelle was happy to help out and have me over. Be warned this is a long post as my crafty mojo was flowing today! This first card I made to play along with the current Seize the Birthday and CAS-ual Friday challenges. I loved this sketch and knew I had the perfect stamp set for it from Altenew “Halftone Stars” and the sentiment from Cas-ual Fridays “Shenanigans” that I inked up in Stampin’ Up Daffodil Delight, Mango Melody, Flirty Flamingo, Melon Mambo, Poppy Parade and Basic Black. The black and white twine and sequins were the finishing touch. Another birthday card added to my stash! I loved the little elephant on Tracey’s card and used an adorable stamp set by Penny Black for my main image. I think this little critter works for a kid card and it’s water coloured using the CAS Colors challenge colours. Card #3 was based on the sketch over at Freshly Made Sketches and then made it a masculine card to fit the Watercooler Wednesday Challenge. I struggle with masculine cards so having a sketch to work with helped focus my design. Not too cutsie I hope! Next up a card for the current Fusion and Gerda Steiner Designs – Share your designs monthly challenges. I don’t have any harbour themed stamps so went with the sketch, which I flipped and relocated the sentiment. I love this irreverent llama from Gerda Steiner and can see myself using him more. Next up is a card for the Paper Craft Crew Challenge #289 which is a theme challenge. I went with the Sprint theme for my card and played around with colouring the flowers in greens and orange and the black and white of the card base, sentiment and twine make the colours pop. My final card is for the Calling all Sistahs challenge #13 which is an image, colour theme or both challenge. I loved the blue tones and the geometric pattern of that stained glass ceiling. I used a stamp set from Ellen Hutson and Catherine Pooler Designs inks for the circles. The sentiment is from CAS-ual Fridays. Another great card for a male. Well thanks for looking and have a great week. Today I’m playing along with the current challenge at Tic Tac Toe Challenge #47. I recently saw an interactive card on YouTube that I wanted to try, so decided to play with the top row of spring/interactive/bright colours. I used a Stampin’ Up set called ‘watercolour wings’ which I stamped the butterflies in Catherine Pooler Designs inks in It’s a boy, Fiesta Blue , Something Borrowed and Black Jack. I splattered some gold ink and added some sequins to fill the gaps on the front panel. When you open this card the centre butterfly twirls. This was my first go and I know I need more practice with the mechanism and think next time that I’ll do the interior decorating before I put the twine in as that was very difficult to get my fingers around. If you’d like to try this card yourself, here’s the YouTube link. This first card is for The Card Concept where I was inspired by the size of the flower and iI used a flower and leaves that I’ve had roughly water coloured in my stash for some time just waiting to be used. The stamp set was borrowed from a friend and I can’t remember which company it’s from but the sentiment is from a set by Altenew called ‘birthday greetings’. I love how the purple and green complement each other and I added a bit of gold thread for some balance at the top of the card. This next card is for both the CAS colors sketch challenge and the Flower Challenge. I used an acetate from panel for my card and attached some stamped and die cut hibiscus flowers and leaves based on the sketch. The sentiment is the same as used on the first card. You can see the acetate front panel better in this next photo. I love how both these cards came out and I think I’ll use acetate for my front panels a bit more as it gives a great effect. I love the challenges over on the Less is More blog. They stretch you to think differently and they are always in my comfort CAS zone. The current challenge is a sketch with lots of circles, so when I saw it I instantly thought of a stamp set I have from Altenew called “Halftone circles’. So I got inky with my Catherine Pooler inks in Melon Ice, Fiesta Blue, All That Jazz, It’s a Boy, Something Borrowed and Black Jack. See, isn’t that set perfect for this sketch? I’m pretty chuffed with how this card came together.